I would like to say thank you very much for attending our Ladies Festival at Norton Park Hotel. You guided me and my wife Valerie throughout the evening and made it a success with your professionalism, it would have fallen flat without your advice. We have just reconciled our numbers from Saturday, so I thought it would be a good time to say a big Thank you for all your efforts… much appreciated! Thanks to you we raised £12,600 on the Auctions and Raffle, which was great. In total, we raised over £30,000 on the night which after expenses (marquee, food and drink, staff, music etc) should contribute around £20,000 to our Development Programme and just as importantly, everybody had a great time! Just wanted to drop a line to say thank you for your help and assistance on Saturday evening. The evening went very well and the feedback has been tremendous. My son absolutely loved it and having you there to co-ordinate the evening really did help me. Thank you for your professionalism on the night and I hope you enjoyed it as much as we enjoyed having you there. I am sure our paths will cross again, but in the meantime, take care. "Thank you so so so much for everything that you did for our special day. From the moment we contacted you the service has been flawless. You made everything a breeze, from organising your travel arrangements to Ireland to executing the formalities on the day. You brought the perfect combination of professionalism along with a friendly relaxed demeanor. You made the bridal party feel at ease and took away any stress so all could enjoy the celebrations. Your presence made everything extra special for us tying the English tradition perfectly with the Irish. For those that had experienced a Toastmaster previously we received nothing but praise on how fantastic you were and for the Irish that hadn't, they thought it was a wonderful touch and really appreciated the benefits of having you there on the day. Thank you so much again for all of your hard work and commitment on the day, we could have not asked for more. We will be sure to recommend your expert services to anyone that asks." May I just say thank you so very very very much for attending our wedding at Brocket Hall, you made me so less nervous than I would have been had you not been there. I cannot praise you and your services highly enough, I will certainly be shouting your name from the roof tops. "Just a quick note to thank you for your professional service as Toastmaster at Lauren and James' wedding on 1st September 2012 – thank you for making the journey to Cornwall. As Mother-of-the-Bride, I really appreciate your service and how well everything went to time and nothing was missed. Thank you once again." "Thank you so much for all the work you put in to make Alix and Liam's day special. I really don't think we could have managed without you. A very big thank you from us all." "Philip was a 'tower of strength' and his consideration and expert advice was much appreciated by me. His control of the whole event was of the highest standard, and his demeanour and courtesy were outstanding". "Thank you so much for being such a fabulous Master of Ceremonies last night - you were a complete star, so helpful and professional, and added that perfect note of gravitas to the evening! I did enjoy working with you and hope our paths cross again". We thought we should email you with our grateful thanks for your Toastmaster services at our wedding last Saturday. Your presence made such a difference, even to a fairly laid-back event such as we wanted. With sufficient formality and gravitas but also warmth and a relaxed approach, you judged the mood nicely. 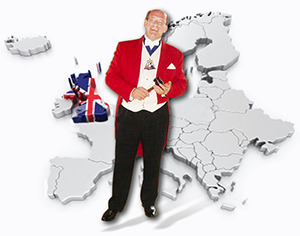 We are quite convinced that we would recommend to anyone running a major function such as a wedding to budget for a Toastmaster (and would particularly recommend you, of course!). Almost essential in our case because we organised the whole thing ourselves, and really needed you to manage procedures. We had many complimentary comments about you from guests, who were very impressed, so it's not just Jenny and I who appreciated what you did. Everyone attending (including you, it appeared) seemed to have really enjoyed themselves, despite the weather. It is a wedding no one is likely to forget – later in the evening the floor became really boggy, and seeing the ladies in their finery enjoying themselves dancing in wellies is a memory Jenny and I will treasure! We are still awaiting the official photographs but attached is a photo of you which my brother George (sitting in front of you at the meal, and who is a keen amateur photographer) took. We think it is a great shot, and hope that you will like it. Once again, many thanks for making the long trip up from Sussex. It was delightful to meet you, and we are so grateful for your invaluable contribution to our special day." "I just wanted to drop you a note to say thank you for providing such an excellent service on Monday 4 June at our wedding. We were really impressed by (and grateful for) the way you helped guide ourselves and our guests through the day and in particular for putting us at ease before the speeches. It was always going to be a fantastic day but your professionalism, good humour and attention to detail helped to ensure the whole day ran without a hitch, flowing seamlessly from the reception all the way through to the cutting of the cake and the first dance. Several guests have since commented to us how much you added to the day. We will be pleased to recommend your service to friends and family and to refer any future business to you. "Just a quick catch up to say a huge thank you for your contribution to what has been described as our best ever dinner. I thought your presence once again gave the dinner a certain gravitas that would not have been there without you. Many of the members commented on how nice it is to have someone in charge. I am not sure if this is a dig at me or they just like seeing that red coat of yours! The dinner was once again a huge success. The members have expressed their feelings with the number of emails we have received saying thank you. Hope to see you next year." "We just want to say a very big thank you to you for making our day perfect. We just watched the video back and it is clear you were instrumental in making everything run so smoothly for us. What would we have done without you? You were professional, caring and I personally want to thank you for taking the care to follow me whilst I struggled through my speech. Looking back it was obvious you had taken the time to really listen to our/my wishes and you were ready to step in if my tears got too much. Thank you Phil, from the bottom of our hearts a truly believe it wouldn't have been as near a good a day if you hadn't been there...I will recommend you to anyone who is in need of a Toastmaster." "Just a note to say thank you so much. Jane and David had a wonderful, wonderful day. Everything ran smoothly and David I think was especially happy to have you there. I know I was! I've been very glad that you were there at both Sarah and Jane's wedding." "Thank you for being a part of Bridget Jones! And thank you for your loud, powerful voice! Even though it may have seemed interminable, the Guildhall sequence is very funny; I've already seen a cut and am very pleased with what we have. My thanks for your patience and your generosity!" "On behalf of Dame Cicely Saunders, I am writing to thank you for so kindly donating your services as Toastmaster at our Dinner last night. I am sure you would agree that the evening was a huge success and was greatly enjoyed by all those who attended. The event has certainly succeeded in raising the profile of St Christopher's Hospice amongst a prestigious group of lawyers specialising in Trust and Estate Law." "Thank you so much for Saturday. You did a fab job at keeping it all running smoothly so thank you. It was a pleasure to meet you."